An outspoken critic of Google has been fired from a US think tank that gets some of its funding from the search giant. The New America Foundation sacked Barry Lynn for "imperilling the institution", reports the New York Times. At the foundation, Mr Lynn headed the Open Markets group that welcomed efforts to rein in technology giants. But the think tank said it had fired Mr Lynn for flouting its rules on openness and "institutional collegiality". Eric Schmidt, the executive chairman of Alphabet, the parent company of Google, has been a board member of The New America Foundation for 15 years including 8 years as its chairman. Last year, Mr Schmidt and his wife Wendy donated a total $5.9m to New America through the Schmidt Family Foundation and a program called the 11th Hour Project. In 2016, Google donated $1.1m. Google said it funded many groups and respected each one's independence even when it disagreed with what they said. 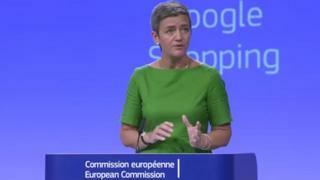 In its report, the New York Times linked the sacking to praise by Mr Lynn's Open Markets group of the European Commission's decision to fine Google $2.8bn (£2.2bn) in June for abusing its market power. In a statement posted on the New America Foundation website, the Open Markets researchers congratulated the commission and called on US government bodies to take similar action to curb "dominant platform monopolists" such as Google, Facebook and Amazon. Soon after the statement appeared, Mr Lynn was called to a meeting with Anne-Marie Slaughter - the head of the foundation - at which she told him that he and the other 10 Open Market staff were being fired. An email sent by Ms Slaughter to explain the decision, and which was quoted by the newspaper, said the firing was not linked to the group's research, but it also suggested Mr Lynn was "imperilling the institution as a whole". Speaking to the New York Times, Mr Lynn suggested the group had been fired at the behest of Google. The New America Foundation denied this charge and in a statement given to the paper said its backers had no "influence or control" over what its staff researched or what they published. The Open Markets researchers had left the foundation as the result of a "mutual decision" following a long period of negotiation, it said. The Open Markets group has now set itself up as independent research organisation and is seeking funding partners. It has also set up a web-based campaign called Citizens Against Monopoly, in which it asks people to log their criticism of Google and others who, it says, seek to stifle criticism. Soon after the newspaper article was published, the foundation posted a statement on its website, in which Ms Slaughter said the NYT's claims were "absolutely false". It also released email messages between Ms Slaughter and Mr Lynn, which, it said, showed he had been "imperilling the institution" by trying to organise a conference to debate the market influence of technology giants, without inviting Google to participate, at a time when the foundation had been talking to the search giant about its support for the institution. In a statement, Google spokeswoman Riva Sciuto said: "We support hundreds of organisations that promote a free and open internet, greater access to information, and increased opportunity." She added: "We don't agree with every group 100% of the time, and while we sometimes respectfully disagree, we respect each group's independence, personnel decisions, and policy perspectives."